In many cases, the meetings were not made public until well after the fact. Questions about possible collusion with Russians interfering in the presidential election have plagued Donald Trump's administration since November. The issue has continued to make headlines partly because more details about previously undisclosed meetings between top Trump campaign officials and Russian officials have emerged over the past several months. From multiple meetings that former Russian Ambassador Sergey Kislyak had with top Trump team members — including Trump himself — to the most recent revelation about Donald Trump Jr.'s June 2016 meeting with a Kremlin-connected lawyer, the list of undisclosed meetings has grown over time. Here is a rundown of the meetings that were made public after they happened. (Brendan Smialowski/AFP/Getty Images, File) Former National Security Advisor Robert Carl McFarlane and Russian Ambassador to the U.S. Sergey Kislyak,right, arrive for a speech on foreign policy by Donald Trump at the Mayflower Hotel in Washington, D.C., April 27, 2016. When and where: April 2016, Mayflower Hotel in Washington, D.C.
Kislyak was seated in the front row as Trump delivered a 45-minute foreign policy address at the Mayflower Hotel, ABC News reported on March 9, 2017. "The line moved quickly, and any conversations with Mr. Trump in that setting were inherently brief and could not be private," read a statement from the Center for the National Interest, which hosted the event. "Our recollection is that the interaction between Mr. Trump and Ambassador Kislyak was limited to the polite exchange of pleasantries appropriate on such occasions." White House officials dismissed the significance of the meeting. "If they met, it was in passing at an arrival reception hosted by National Interest, which [Trump] was present at for all of 5 minutes," a senior White House official said after Trump's and Kislyak's attendance was widely reported. 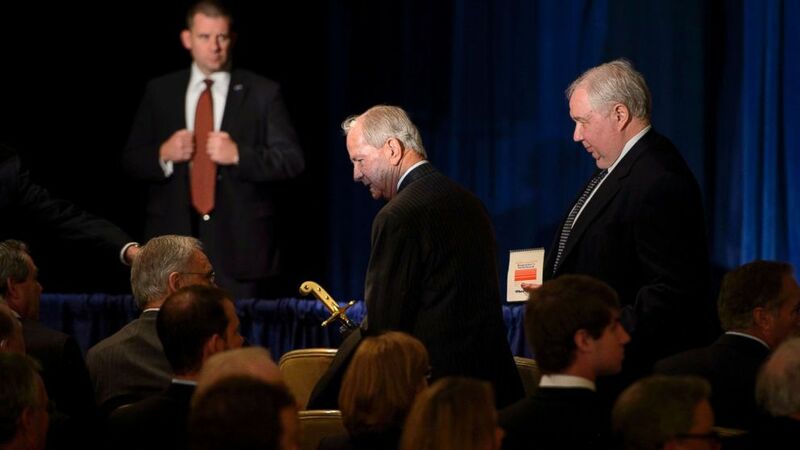 "We arrived minutes before the speech began and departed immediately after." Trump and Putin met earlier in the day — which was disclosed to the press in advance. But the two leaders also privately conversed that evening at a dinner that excluded journalists. This second meeting was not disclosed for 11 days. "During the course of the dinner, all the leaders circulated throughout the room and spoke with one another freely," a White House official said in a statement. "President Trump spoke with many leaders during the course of the evening. As the dinner was concluding, President Trump went over to Mrs. [Melania] Trump, where he spoke briefly with President Putin." During a White House press briefing on July 19, 2017, then–deputy press secretary Sarah Sanders said, "We weren't following him around with a stopwatch, but ... it was a brief conversation and certainly not an hour." (Carolyn Kaster/AP) Donald Trump Jr., the son of President Donald Trump, speaks to media on the South Lawn of the White House in Washington, April 17, 2017. With whom: Russian lawyer Natalia Veselnitskaya; Russian lobbyist Rinat Akhmetshin; interpreter Anatoli Samachornov; Ike Kaveladze, an employee of the Crocus Group, a Russian company; music publicist Rob Goldstone; then–campaign chairman Paul Manafort; and Donald Trump Sr.'s son-in-law, Jared Kushner Read more about this group here. When the meeting was disclosed: July 8, 2017; details and attendance list emerged over the course of the following week. A business acquaintance reached out to Trump Jr. on June 3, 2016, saying that a client of his and the client's father had "information that would incriminate Hillary," referring to the eventual Democratic presidential nominee, Hillary Clinton. According to the email chain that Trump Jr. subsequently released on Twitter, he responded to that email by writing, "If it's what you say I love it especially later in the summer." Trump Jr. coordinated the logistics of the June 9, 2016, meeting in Trump Tower and invited Kushner and Manafort. 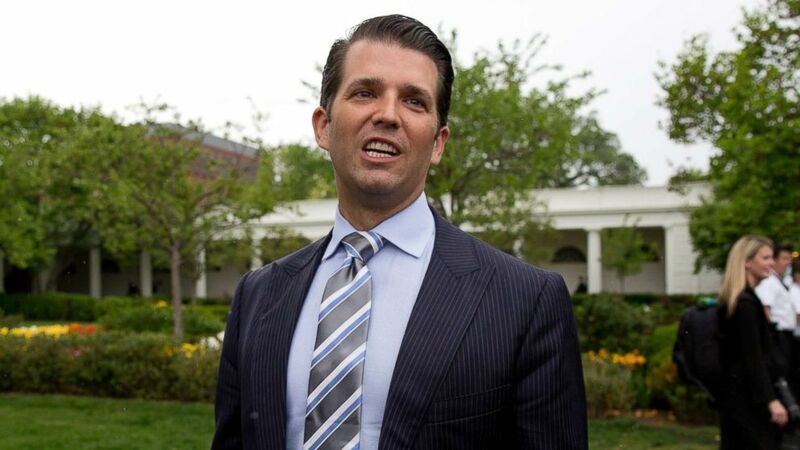 Trump Jr. said he met with Veselnitskaya without knowing who she was but did so at the urging of an acquaintance who said that she had information that could be helpful to his father's presidential campaign and damaging to Clinton. Trump Jr. suggested it was a bait and switch, but he has revised his account of the meeting repeatedly since it became public. "[Veselnitskaya's] statements were vague, ambiguous and made no sense. No details or supporting information was provided or even offered," he said in his second public statement on the issue, going on to suggest that American adoptions of Russian children was her "true agenda all along." After there were calls for him to meet with the Senate Intelligence Committee about the meeting, he said he would be "happy to work with the committee to pass on what I know" and hired a lawyer. On July 31, 2017, it was reported that President Trump dictated his son's first statement, on July 8, 2017, about the meeting, which said the meeting was about adoption policy and did not include any mention of obtaining information about Clinton. In 2012, Congress passed the Magnitsky Act, which imposes sanctions against Russian officials accused of human rights violations. Russia swiftly retaliated by banning the adoption of Russian children by Americans. Veselnitskaya has said repeatedly that she went to the meeting with Trump Jr. to talk about Russian adoption policy, and that stance is bolstered by an email exchange between her and Goldstone that was made public on Oct. 9, 2017. That email exchange happened on the morning of the Trump Tower meeting, and Veselnitskaya writes about the main topic of the meeting being adoption policy. This account, which was first reported by The Washington Post and confirmed by ABC News, appears to run counter to the email Goldstone sent Trump Jr. suggesting that it would provide the Trump campaign with potentially damaging information about Clinton. When the other possible meetings were disclosed: July 11, 2017, during an interview with Fox News' Sean Hannity. While talking about the June 9, 2016, meeting with Veselnitskaya and others, Trump Jr. was asked if he met "with any other person from Russia that you know." "You know, I don't even know. I've probably met with other people from Russia," Trump Jr. said, before Hannity asked whether such meetings happened during the campaign. Trump Jr. said that the possible meetings were "not in the context of actual — a formalized meeting or anything like that, because why would I?" 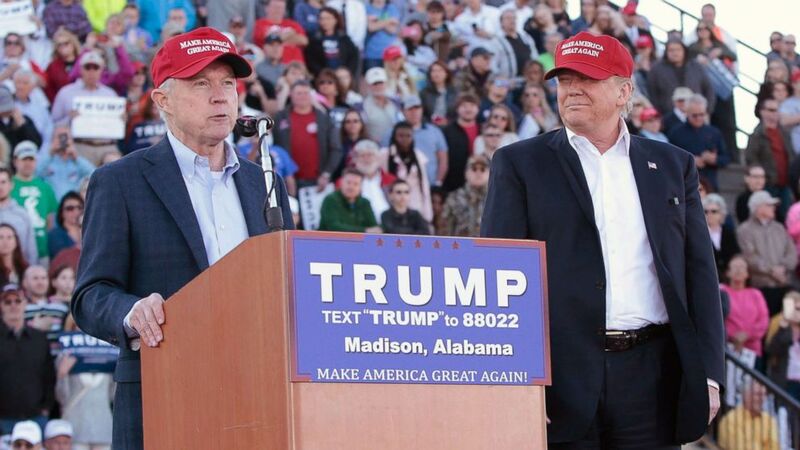 (Taylor Hill/WireImage/Getty Images) Senator Jeff Sessions becomes the first Senator to endorse Donald Trump for President of the United States at Madison City Stadium on Feb. 28, 2016 in Madison, Alabama. The first confirmed meeting between Sessions and Kislyak occurred at an event held by the Heritage Foundation, a conservative-leaning think tank, during the GOP convention. At the time, Sessions was a senator and one of Trump's most prominent surrogates. After his speech at the event, Sessions spoke to a small group of ambassadors. Kislyak was among them. In March 2017, it was confirmed that Sessions used funds from his re-election account to pay for campaign expenses at the RNC. Sessions released a statement on March 1, 2017, saying, "I never met with any Russian officials to discuss issues of the campaign." He has since recused himself from any matters related to the Department of Justice's Russia investigation. A Justice Department official emphasized to ABC News that the meeting in Sessions' Senate office was listed publicly and attended by staff members. A DOJ spokesman said such meetings occurred in connection with Sessions' Senate activities and that Sessions had been advised not to include any such meetings in security clearance disclosure forms. The various meetings that Sessions had with Kislyak did not focus on the election, but sometimes the ambassador made superficial comments about it, a DOJ official said. (Alex Brandon/AP) White House Senior Adviser Jared Kushner listens as President Donald Trump speaks during a meeting in the Cabinet Room of the White House in Washington, Sept. 12, 2017. When and where: April 2016, Mayflower Hotel in D.C. In a written statement submitted to congressional investigators on July 24, 2017, Kushner said that he met four ambassadors, including Kislyak, at an event and "each exchange lasted less than a minute." "With all the ambassadors, including Mr. Kislyak, we shook hands, exchanged brief pleasantries, and I thanked them for attending the event and said I hoped they would like candidate Trump's speech and his ideas for a fresh approach to America's foreign policy," Kushner wrote. With whom: Veselnitskaya, Akhmetshin, Samachornov, Kaveladze, Goldstone, Manafort and Trump. Jr. When the meeting was disclosed: Kushner was present at a meeting arranged by Donald Trump Jr., and more details about how the meeting was set up can be found above in Trump Jr.'s section. In Kushner's statement to the congressional investigators, he wrote that he "quickly determined that my time was not well-spent at this meeting." "I actually emailed an assistant from the meeting after I had been there for ten or so minutes and wrote, 'Can u pls call me on my cell? Need excuse to get out of meeting,'" he wrote. In his statement to congressional investigators, Kushner said Kislyak had reached out for the meeting on Nov. 16, 2016, and one was scheduled two weeks later. 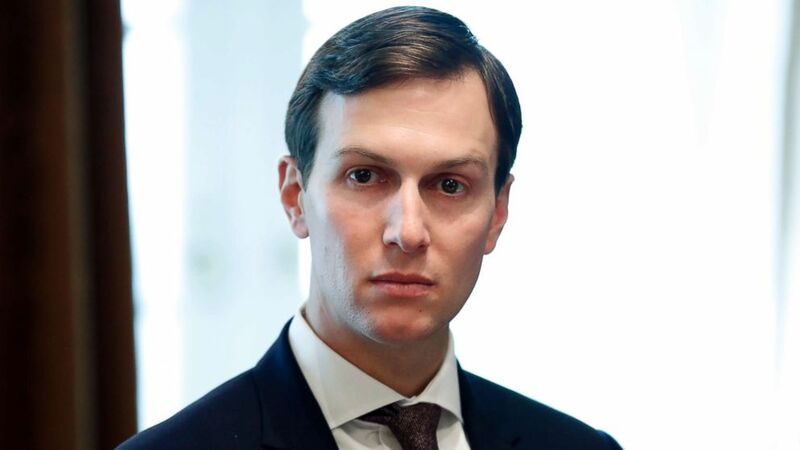 "During the meeting, after pleasantries were exchanged, as I had done in many of the meetings I had and would have with foreign officials, I stated our desire for a fresh start in relations," Kushner wrote. At Kislyak's request, Kushner met with Russian banker Sergey N. Gorkov, the chief of Vnesheconombank. Kislyak was not present for this meeting, a senior White House official told ABC News. After the meeting was made public, Kushner volunteered to speak with the Senate Intelligence Committee as part of its broad inquiry into ties between Trump associates and Russian officials or others linked to the Kremlin. Kushner wrote that Kislyak met with Kushner's assistant on Dec. 12. During that meeting, Kislyak reportedly "requested" that Kushner meet with "a person named Sergey Gorkov who he said was a banker and someone with a direct line to the Russian president who could give insight into how Putin was viewing the new administration." Gorkov, Kushner continued in his statement, "said he was friendly with President Putin, expressed disappointment with U.S.-Russia relations under President Obama and hopes for a better relationship in the future." Kushner wrote that Gorkov "gave me two gifts — one was a piece of art from Nvgorod, the village where my grandparents were from in Belarus, and the other was a bag of dirt from that same village." More than 100 calls or meetings remain undisclosed. It is unclear if the since-disclosed meetings are included in that number. Kushner's attorney released a statement confirming that Kushner interacted with representatives of at least 20 foreign governments — either in person or by phone — about 100 times during the campaign. His security clearance form, which was reportedly updated with that information, has not been publicly disclosed, and no details of these meetings and conversations have been shared with reporters. "He has since submitted this information, including that during the campaign and transition, he had over 100 calls or meetings with representatives of more than 20 countries, most of which were during transition. Mr. Kushner has submitted additional updates and included, out of an abundance of caution, this meeting with a Russian person, which he briefly attended at the request of his brother-in-law, Donald Trump Jr. As Mr. Kushner has consistently stated, he is eager to cooperate and share what he knows," Kushner's attorney said in a July 8 statement. (Andrew Harrer/Pool via EPA/FILE) National Security Advisor Michael Flynn arrives to a swearing in ceremony of White House senior staff in the East Room of the White House in Washington, Jan. 22, 2017. 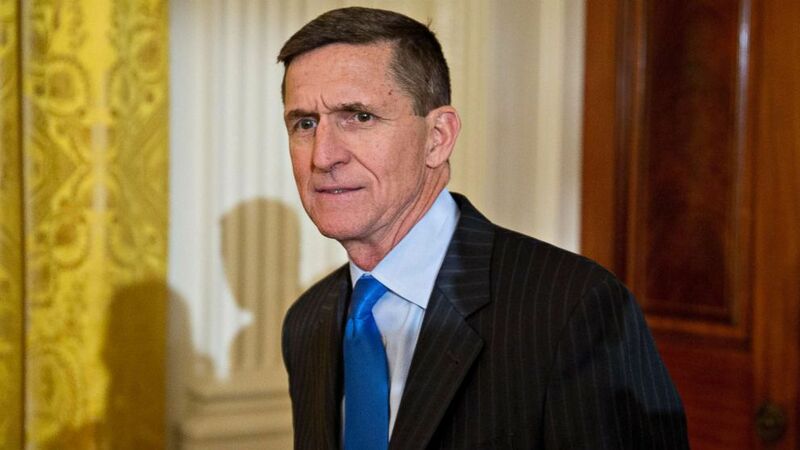 Flynn resigned as national security adviser on Feb. 13, 2017. The nature of his texting and verbal conversations with Kislyak were not initially disclosed, and he said he "inadvertently" misrepresented those conversations to Vice President Mike Pence in January. His in-person meeting with Kislyak on Dec. 1, 2016, was not disclosed until two weeks later, when The New York Times reported it. Kushner, who also attended, later detailed the meeting in his written statement to congressional investigators in July. 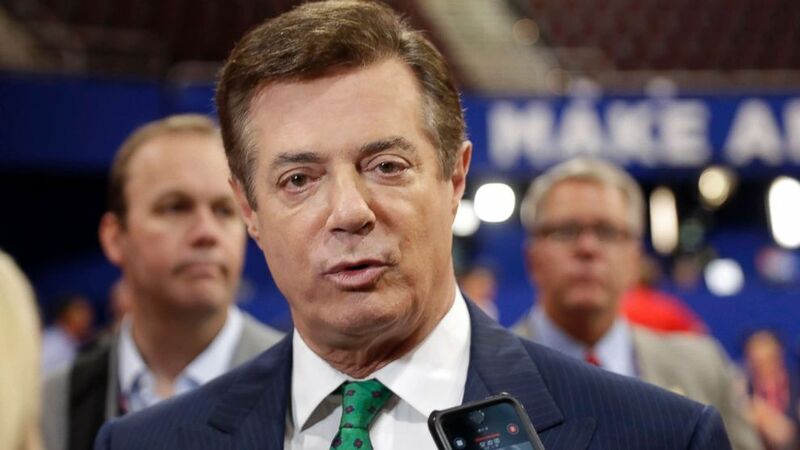 (Matt Rourke/AP/FILE) Trump Campaign Chairman Paul Manafort talks to reporters on the floor of the Republican National Convention at Quicken Loans Arena in Cleveland, July 17, 2016. See Trump Jr. and Kushner sections above for details. ABC News' Justin Fishel, Katherine Faulders, Adam Kelsey, Pierre Thomas, Ben Siegel, Alex Mallin and Matthew Mosk contributed to this report.